The 2018 Kia Optima is a segment leader in many key areas, running the gamut from affordable family transport to high-performance turbo sports sedan. In addition, two hybrid models, including a plug-in, ensure excellent fuel economy, and there's always that great 10-year/100,000-mile powertrain warranty. The 2018 Kia optima is one of the best cars within its category. First, the look of the car is on trend with many pricier cars in its class (BMW, Mercedes, etc.). It is a good looking car. The inside is stacked with awesome features that come standard on this car. The apple car play is awesome, reverse cameras, screen displays, USB port, mp3 jack, and so much more. Look and features 10/10. Biggest drawback for me is the horsepower, not as much go power as I was expecting. But they do have three driving modes sport, regular, and eco. Which is cool, but so far the best mpgs I get is in standard even over eco. But that could be due to my particular driving style. 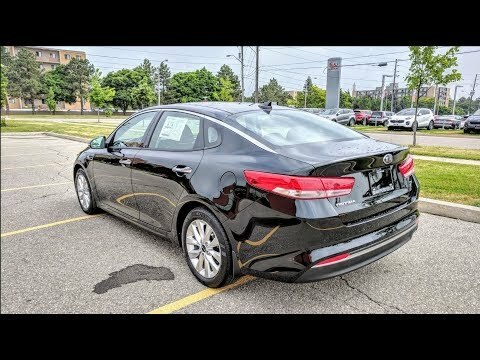 Overall I think it is an excellent car and would definitely recommend the Kia optima for someone looking for high quality, great features, updated look, at an affordable price. Mid-sized sedan with luxury interior. I love my Kia optima. The seats are very roomy and supportive. The touchscreen is well-made and very user-friendly. My favorite part of my car is the blind spot monitoring. It is an optional feature that you can turn on and off depending on where you drive. The sunroof is enormous and makes you feel like you are not even in a vehicle. The engine is so quiet you cannot hear it running, and it runs so smoothly. I haven't had any problems in my car yet, so I would consider it to be a very reliable vehicle. The backseat is very large and has so much room my six foot tall friend can fit in the backseat without touching her knees or her head to any part of the car. The air conditioner works very quickly, as well as the heat. Kia is a lot nicer than you remember! The optima ex with the premium package is an amazing vehicle. It is visually beautiful, inside and out. The level of comfort matches any luxury car. Amenities are over the top. Features include a panoramic sunroof, leather seats that are heated and cooled!! 8 inch touch screen with Apple CarPlay. Radio has 40 presets!! Both front seats are power operated. Color scheme choices are so beautiful. Mine has two gray tones, brushed metal trim and a beautiful dark woodgrain. Smart key technology is so cool. The car loves me too! When I come near it, the door handles light up and the mirrors unfold, it sings a little song when I get in and says welcome! There are 11 airbags including full curtain coverage. Stereo is fantastic!